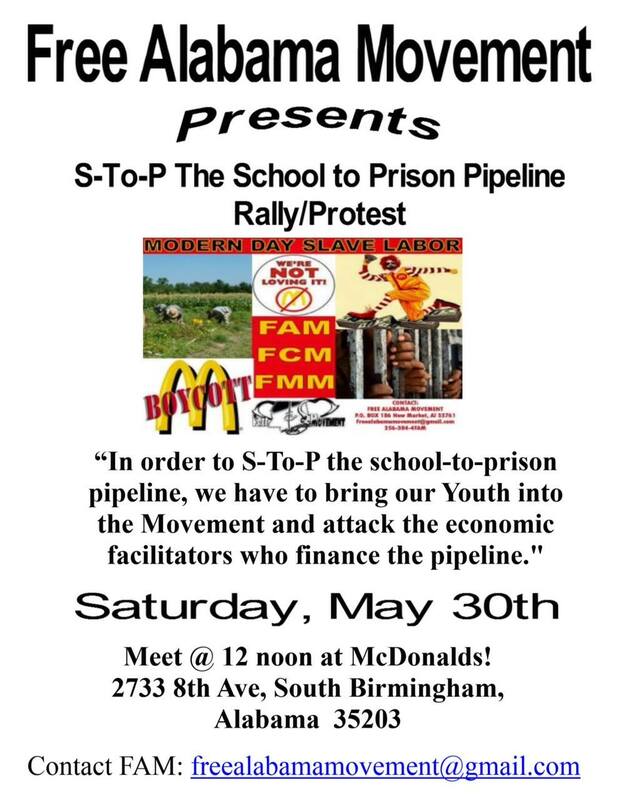 National Freedom Movement’s “S-To-P” Campaign Against McDonald’s to “S-To-P” the “school-to-prison” pipeline. 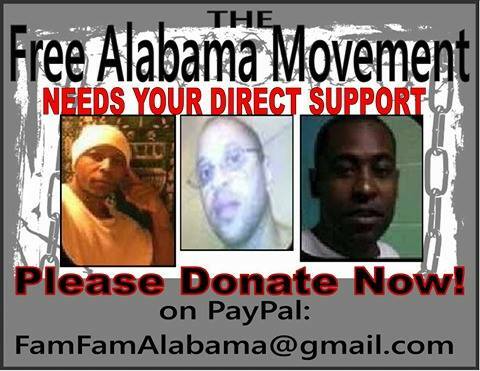 FREE ALABAMA-MISSISSIPPI MOVEMENT UNITED . . . we got our Youth covered. 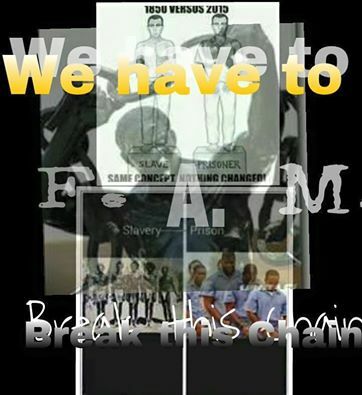 F.A.M.’s Step 3 McDonald’s INITIATIVE: “S-To-P” the “school-to-prison” pipeline. 1) S-To-P doing business with companies that invest in, and profit from laws and school policies that target children for the “school-to-prison”. 2) S-To-P doing business with companies that build factories in prisons but not in our communities. 3) S-To-P doing business with companies that pay slave wages to people in prison, but won’t employee people in high-unemployment communities. 4) S-To-P doing business with companies that profit off of mass incarceration FOR prison slavery. In the 1600’s and 1700’s when slavery took off in America, the British Crown and other foreign companies financed the slave transport systems that helped to ship millions of men, women and children of African descent around the world for forced slave labor. Also victimized by these slave traders were the Native inhabitants of North and South America. In 2015, slavery continues on around the World and particularly in America in the front of mass incarceration FOR prison slavery. The companies that now invest in the transport of men, women and children predominately of African descent (and Native inhabitants and Mexicans) are familiar names like McDonald’s, Wendy’s, Dell Computers, CCA, GEO Group, U.S military, Victoria’s Secret, AT&T, WalMart and so many more. But instead of shipping human cargo from the continent of Africa, the U.S. slave market now ships directly from predominately black inner-cities communities and other poor communities inhabited by Africa/Black/Mexican/Native/Poor people. 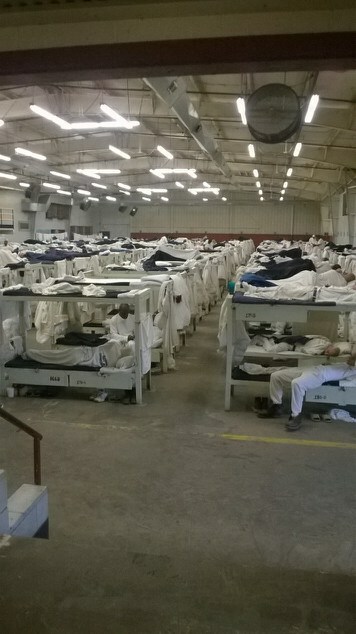 Today the lifeline of this mature capitalist market has come to be known as the “school-to-prison” pipeline, where children in poor black communities are under attack for prison by market forces that create poverty, unemployment, political assault from so-called criminal laws, under-investment in schools, AND multi-generational absences of millions of black men, women and children who are incarcerated in US prisons. In response to this, FREE ALABAMA MOVEMENT has developed a 6-Step Plan of ACTION 2015, and Step 3 of this plan involves strategizing around the economics factors of the pipeline and targeting companies one at a time, starting with McDonald’s, who are involved in this modern slave trade. Just like all other issues in American society, in other to overstand the Problem and to understand the Solution, all you have to do is follow the money. 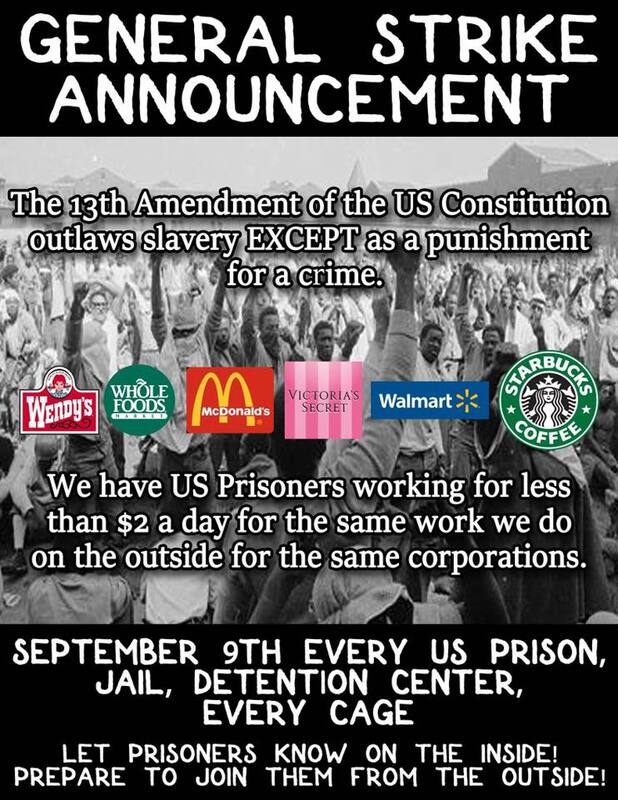 As we said, McDonald’s is just ONE of the many thousands of companies that profit off of prison slavery. 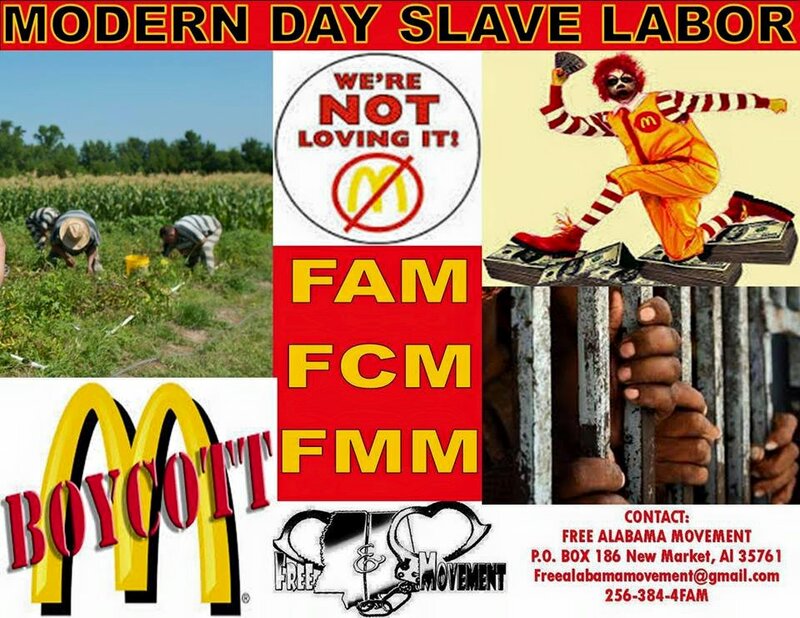 In our McDonald’s research group, “FAM-FMM UNITED Against McDonald’s”, we show where McDonald’s uses prison slave labor to produce products like their uniforms, spoons, frozen foods, process beef for patties, and also to process bread, milk and chicken products. McDonald’s and other companies benefit from prison labor because they reduce labor cost by employing people in prison for either free or penny slave wages. No minimum wages, no overtime, no earned vacation or sick time, no 401k contribution or maternity leave. No healthcare insurance, NOTHING!!! And, anyone refusing to work is met with paperwork that can affect release, result in loss of visits with families and children, threats, and even violence by correctional guards. 1) Companies like McDonald’s invest in or build prison factories to produce their goods like uniforms, patties, spoons, frozen food, etc. They build factories in prison to produce these products, but they won’t build these same factories in our communities to provide jobs. 2) Then, these companies build most of their storefronts outside of our communities and deny jobs to people from our communities, including those of us with felony convictions who need a job to stay out of prison. This is how they manufacture unemployment, which inevitably leads to crime. 3) Finally, after denying us a job in society, Ronald McDonald and his corporate friends who also invest in prison slave labor, wait for the men and women to get caught up in mass incarceration and the school-to-prison pipeline. 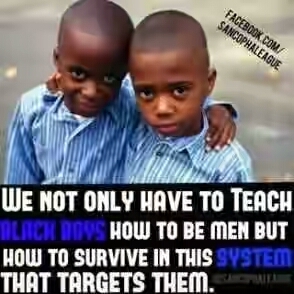 Once they have us in prison, they force us to work for them in their prison factories for free. We can SOLVE the school-to-prison pipeline by dismantling the economic incentive for the pipeline. None of these problems would exist if they weren’t making money off of them. So in order to uproot the problem, we have to attack it at the economic core. We have to organize at the companies like McDonald’s — one company at a time — who are investing in these practices to expose these slave traders for what they really are and force them to stop investing in prison slavery. “We will start off our McDonald’s protest by locating and reaching out to the people in the prisons where McDonald’s products are produced. At the same time, we will begin letter-writing campaigns to their investors and shareholders, while also leaving leaflets/pamphlets on the cars of their customers at McDonald’s restaurants nationwide, and organize protests at their storefronts, in a mall or headquarters, or wherever we can, and call for boycotts of their stores to force then to stop using products that are manufactured by forced prison slave labor. 2) Feel the wrath of the People until we close these storefronts down that are exploiting us by taking the money that we spend with your company to build prison factories, while at the same denying us employment. On the inside, we have to organize work strikes to stop producing products for these companies like McDonald’s who have economically conspired against us to fuel mass incarceration FOR prison slavery. 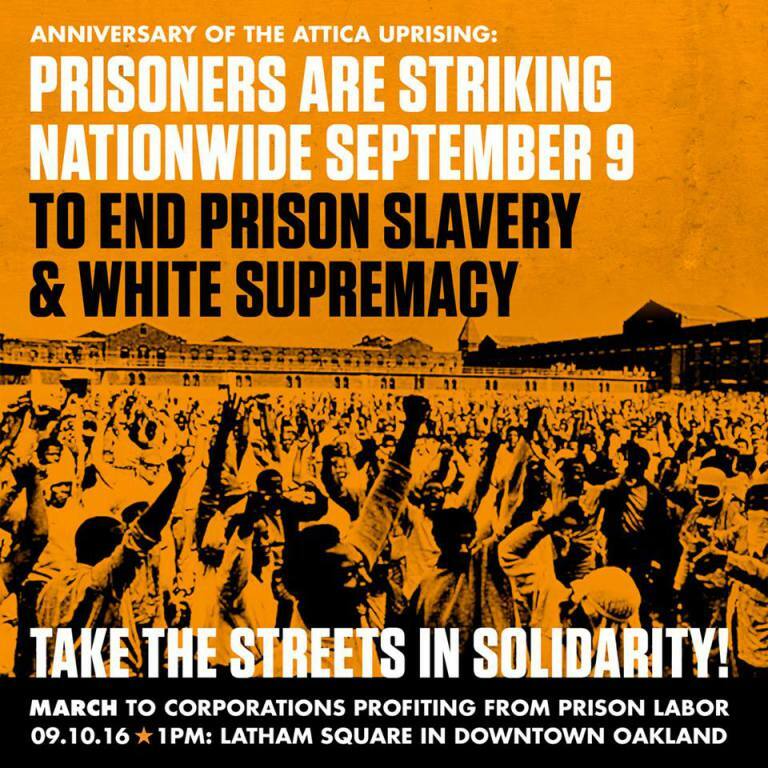 We have to strike to shutdown these prison factories that were built for us in prison, but not in our communities. Work strikes remove this revenue from the prison budgets and puts additional economic pressure on their budgets to release us. If McDonald’s and other companies want to hire us for jobs, then hire us in our communities where unemployment is high, not in your prison slave factors, where incarceration is at an all-time high of 2.5 million Americans. 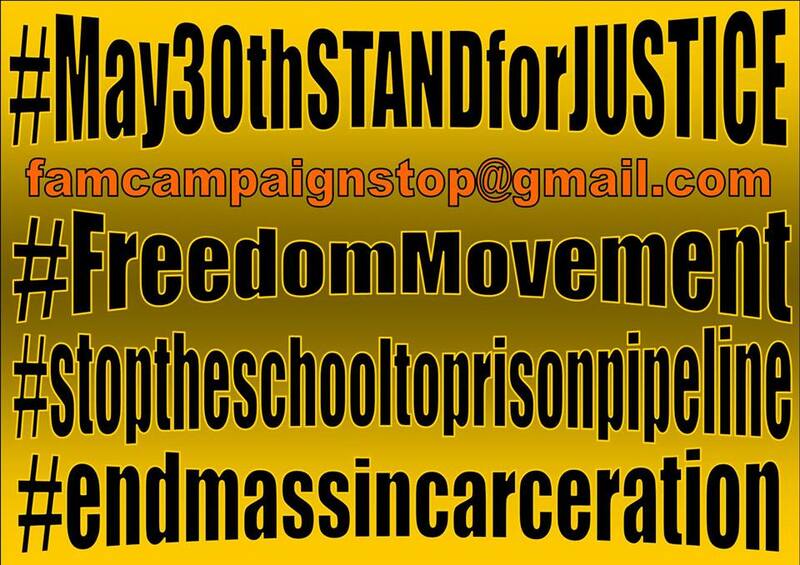 In our Step 3 McDonald’s INITIATIVE, we also want to bring our Youth into the Movement, educate them about the economics behind mass incarceration, and give them a Voice and direct action against the corporations that target them or have kidnapped their family member or loved one. We have an army of Children being targeted in their schools for the school-to-prison pipeline AND we have an army of Children who continue to be impacted by mass incarceration FOR prison slavery with a parent or other family member or loved one in prison. We must work collectively to unmask this clown and expose him to our children as an investor who is betting on our children having a future serving them on the school-to-prison pipeline. Step 2. 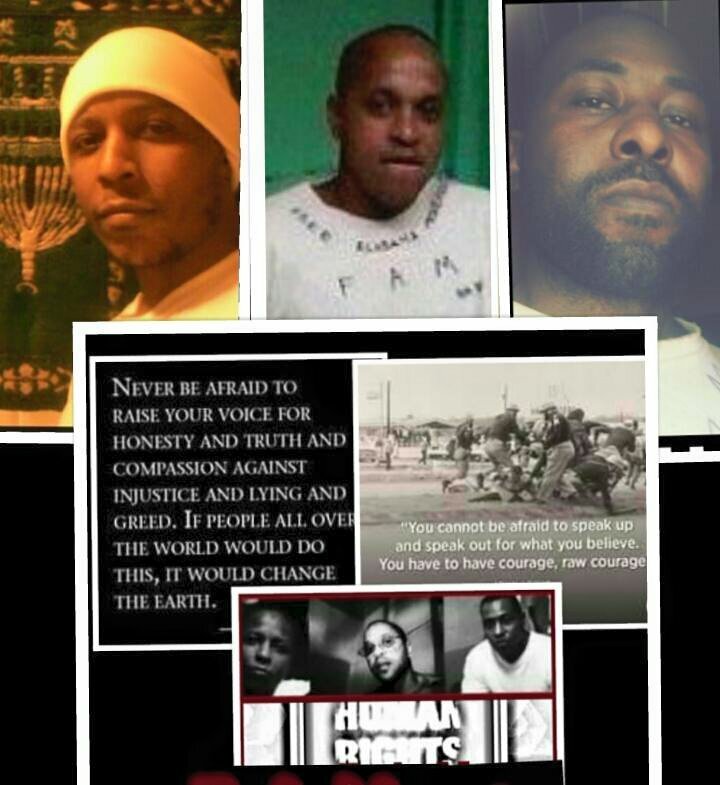 Find a prison in your State and make it the Headquarters for your FREE – (YOUR STATE’S NAME) MOVEMENT. Step 5. Announce a National Shutdown Day for ALL incarcerated laborers!!! 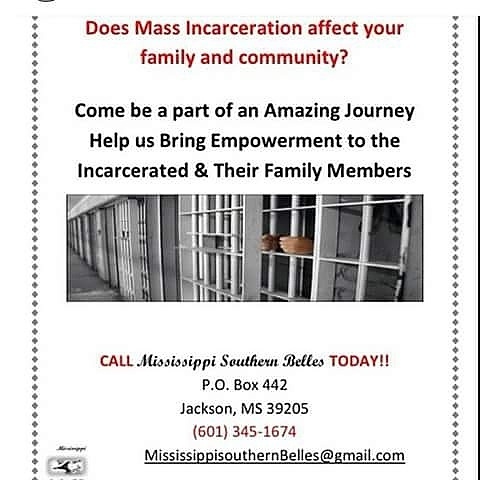 Everyone knows about the problems of mass incarceration and prison slavery, but only FREE ALABAMA-MISSISSIPPI MOVEMENT UNITED has the solution. S.O.S. 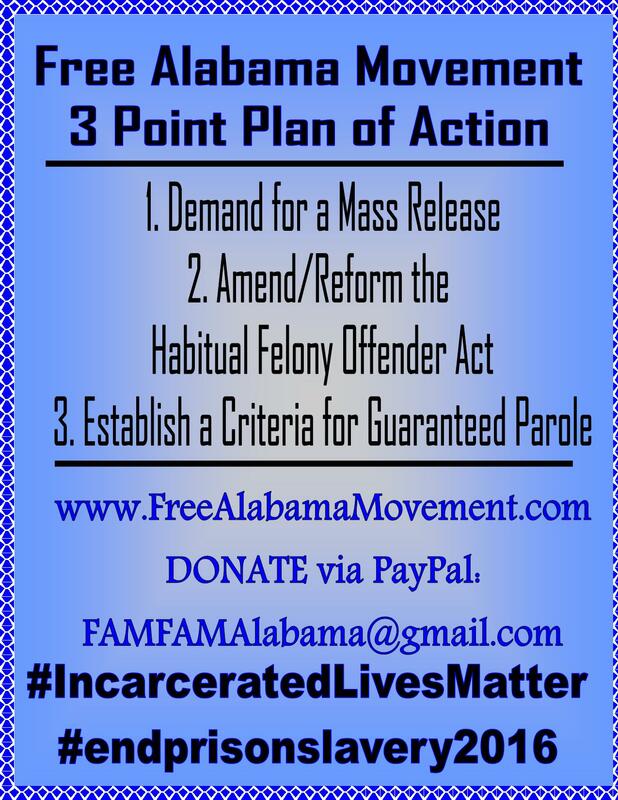 If you want to join the fight against Mass Incarceration and Prison Slavery, FREE ALABAMA-MISSISSIPPI MOVEMENT needs your help. 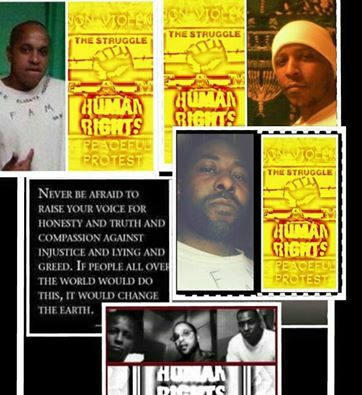 Adopt a prison or any other place of incarceration and a McDonald’s in your city/county/state, start organizing a Non-Violent and Peaceful protest n join the National Movement Against Mass Incarceration and Prison Slavery.